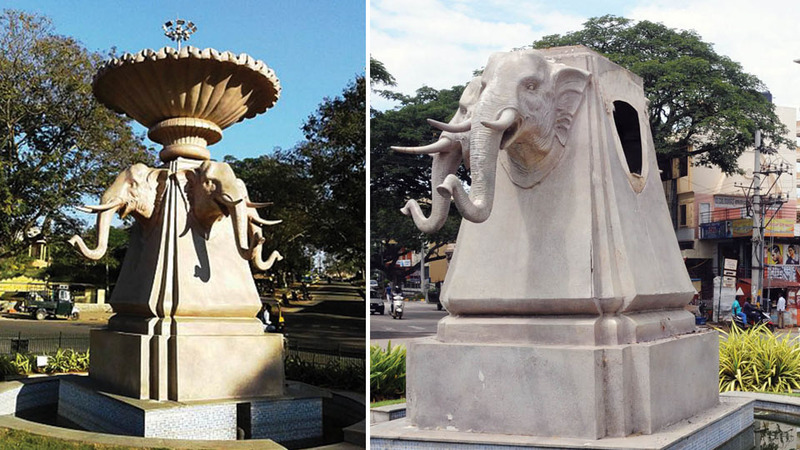 Home » Columns » Abracadabra By K. B. Ganapathy » Mysuru celebrates Ganesha Fest by destroying Elephant Fountain! On Wednesday, 12th September when I was driving to my office in Bannimantap, I was witness to the ugly face of some Mysureans. The beautiful fountain, known as elephant fountain, because of the four elephant heads it carried, was vandalised. I was devastated. I was angry. The Police and the Mysuru City Corporation (MCC) Officials may call those vandals as ‘miscreants.’ But no. I would call them criminals and the authorities — in this case, the MCC and the Police — should suo motu take criminal action against these vandals, not waiting for the ‘affected party’ to complain as is the ‘escapist’ policy. Destroying public property is a crime against citizens, if not against civilised humanity. People are the affected party. The donor of that fountain, the well-known builders Brigade Group, dedicated it to the people of this city. Only when Police act quickly setting the criminal law in motion the criminals can be caught and brought to justice. Their action will be a deterrent to other such vandals only when they are caught quickly and brought to justice. Our city has long been a victim of this kind of vandalism and also theft of public property. Surprisingly, both the Police and those who are custodians of these public property failed to take action and punish the culprits. It is often said because of political interference it has not been possible to take action against the culprits. Whatever might be the reason, the truth is that as a result of no criminal action being taken, this kind of theft and vandalism are taking place unabated. READ ALSO Exit of A.H. Vishwanath from Congress: Who will represent Congress in Mysuru-Kodagu Lok Sabha Constituency? Star of Mysore and its sister publication Mysooru Mithra have been exposing this kind of theft and vandalism for many years now. Recently, the vandalism on this elephant fountain by political parties and social organisations, who tie strings of flags, festoons, buntings and paste the posters of their mighty leaders thus disfiguring the beautiful sculpture installed at a cost of Rs. 25 lakh, was brought to the notice of MCC officials. The Public Relations Officer (PRO) of MCC wrote to Star of Mysore a letter saying “the civic body has been conserving the beauty of the city and cases have been registered at various Police Stations against organisations found disfiguring public places under Prevention of Disfigurement Act, 1981.” The Act states that such an act is a crime and the offenders could be sentenced to one year imprisonment along with penalty. However, when I checked about the end-result of those actions per our Reporters, I was told the MCC in fact had not taken any action as claimed by the PRO. This is the reason why this kind of vandalism goes on unabated. In the 1960s and 1970s we could see the huge K.R. Hospital premises well secured with dwarf compound wall mounted with elegant cast-iron runners. Where are they now? Occasionally, I see them in the gujari and sitting pretty on the compound wall of gentlemen with a great sense of antique artefacts and heritage. And what about those cast-iron lamp-posts that once enhanced the beauty of the city roads, specially the Lalitha Mahal Palace Road? One by one they disappeared. I foolishly thought they must be in some museum in the city. But where is the museum? A Royal City like Mysuru has no museum! Shocking. Go to Rajasthan and see Jaipur Museum or Salar Jung Museum in Hyderabad. 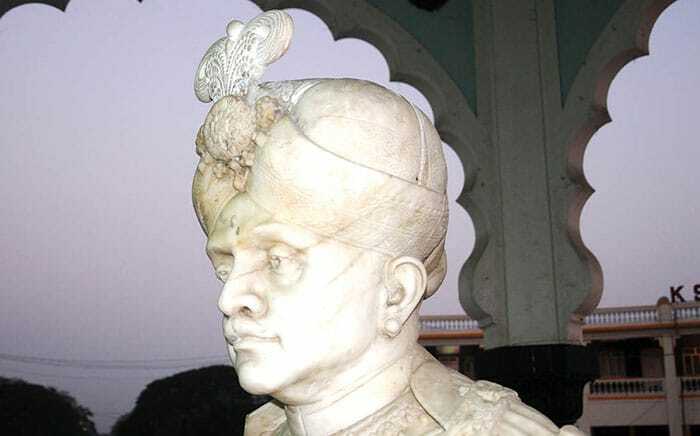 Nalwadi Krishnaraja Wadiyar Statue at KR Circle after its damaged metal pendants in the turban were replaced. This is the city that suffered vandalism of that iconic Krishna Raja Wadiyar (IV), KR Circle Statue of Maharaja, so also of the Statue of Chamaraja Wadiyar at the North Gate of the Palace. Once the marble sword itself was stolen and it remained so for a long time till a philanthroper Zubair Khan of National Marbles gifted a similar sword and restored the old glory. Once, I saw two youngsters removing a length of iron grills from the park near my house, loading it on their cycle and riding away. I asked my security to chase them on his scooter and deal with them properly. He did. He took them to the Nazarbad Police. But, next day I see them back at their job at another area of the Park. I threw up my hands remembering an axiomatic Kannada proverb, ಊರಿಗೆ ಊರೇ ಹೋದರೆ, ಶಾನುಭೋಗರಿಗೇನು, when the whole village is lost, what does it matter to its government official Shanbhog? A society where crime is not punished will be doomed to suffer vandalism of this kind and also social disorder with endemic criminal activities. The case of the elephant fountain is vandalism most foul, sadistic and self destructive. This is the face of independent India today! A few years ago, Mysuru City Corporation came up with a proposal to cover all the statues of Maharajas of Mysore with the glass panes but it did not materialise as the authorities had other reasons to shelve that proposal. 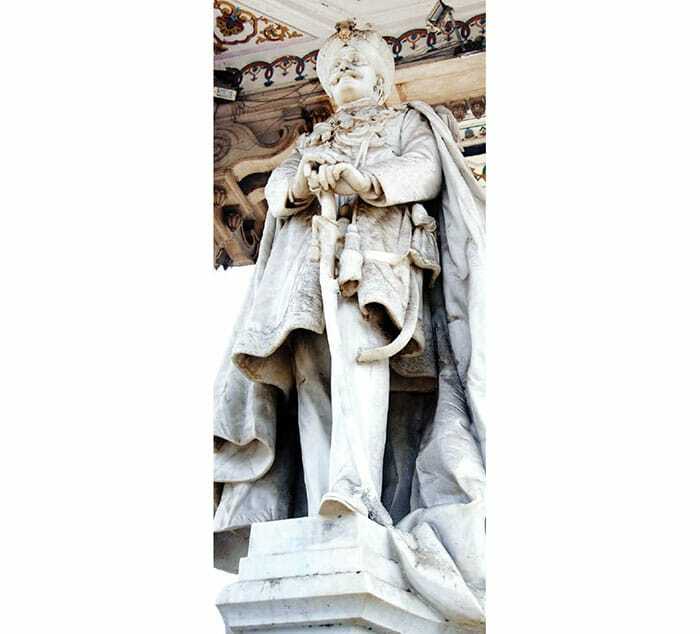 Recently, the sword of Nalvadi Krishna Raja Wadiyar had gone missing and it’s no surprise if anyone takes away the statue. There is no security guards to take care of those statues. At least, some big companies must come forward to deploy the private security guards as part of Corporate Social Responsibility since the MCC has totally forgotten its responsibility. Well written article. The beauty and heritage of the city needs to be restored. Law should be firm on those that create these type of riots in the city. If no action is taken, the culprits confidence inflate and they resort to many other destructions of public property.